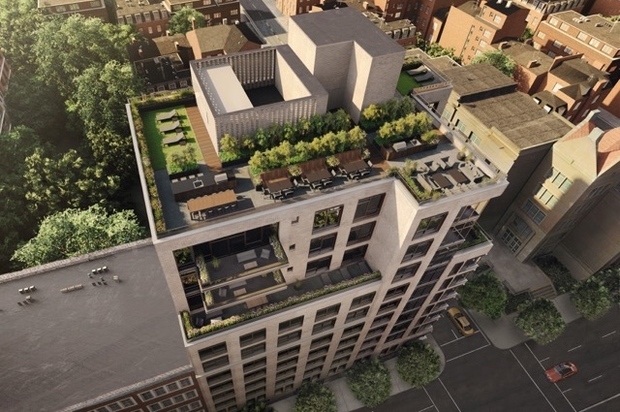 A rendering of the rooftop of Baltic, an 11-story condo building opening at 613 Baltic St., on Fourth Avenue, in Park Slope. PARK SLOPE — A luxury high-rise coming to Fourth Avenue will have a rooftop terrace with a killer view — of a movie screen. Baltic, an 11-story building at 613 Baltic St., is slated to start sales next month on 44 apartments priced at $920,000 and up. In addition to grills and a dining area, the building's roof will have a spot for al fresco movie watching, a spokeswoman for JDS Development said. Other amenities at Baltic will include a 24-hour "lobby attendant," a fitness center with floor-to-ceiling windows, Miele washer and dryers, Nest thermostats and bathrooms with radiant floor heating. Another "standout" feature, according to the JDS spokeswoman, will be the building's "abundant" green space, including a garden off the lobby and a landscaped terrace next to the residents’ lounge on the second floor. The building is expected to welcome residents next year. It's being built by JDS Development, which also built 202 8th St.
Baltic will be mostly two- and three-bedroom apartments, with only two one-bedroom units, according to the New York Times, which wrote that the new high-rises erupting on Fourth Avenue have given the busy street "a cleaner, more inviting look." A rendering of Baltic, slated to open in 2017 on Fourth Avenue and Baltic Street. 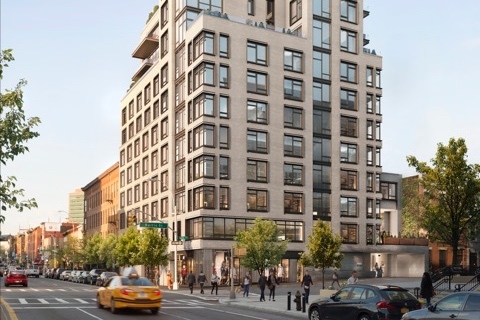 Baltic, which replaced six low-rise residential buildings, is on a part of Fourth Avenue that was "once seen as a dead zone on the edge of Park Slope," according to the Times. A view of Baltic Street and Fourth Avenue in 2014, when JDS Development pulled permits to demolish six residential buildings. The building is one of more than a dozen high-rises in the works for the stretch of Fourth Avenue that runs between Park Slope and Gowanus.